Follow your day-of-surgery preparation instructions described below carefully. Do not drink or eat anything after midnight, as instructed. Your surgery will be cancelled if you do not follow these instructions. Bathe or shower the morning of your surgery. DO NOT wear lotions, hair sprays, hair gels, or perfume. Remove all body piercings. Leave your valuables at home for safekeeping. Arrival times are scheduled generally 90 minutes prior to surgery. You will be contacted by a Surgery Center nurse the day prior to your surgery with the time you should arrive. Remember to bring your health insurance card and photo identification. A receptionist will greet you upon your arrival to review demographic information,obtain signatures on appropriate forms and collect a co-payment, if applicable. 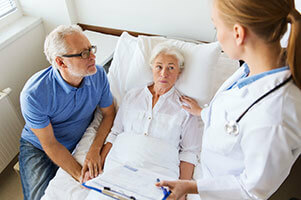 A brief review of your medical history will be taken and your vital signs will be recorded. 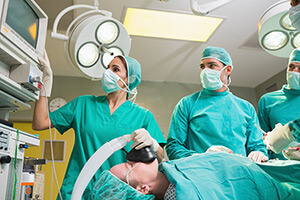 Anesthesia is a medication that keeps you comfortable during your procedure and is administered by a highly trained specialist, either an anesthesiologist or a nurse anesthetist. You are totally asleep and unaware of your surroundings. It can be administered by an intravenous injection through a thin tube in your arm or inhaled as an anesthetic gas. Regional anesthesia numbs certain areas of the body so that you do not feel pain. You may also receive additional medications to relax you. Monitored sedation keeps you relaxed and comfortable. You may remain awake and aware throughout the surgery, or you may be drowsy or in a light sleep. Local anesthesia affects only the area involved in the procedure. It may be used in combination with sedation. Surgery takes place in an operating room (OR) where a brightly lit, temperature-controlled and sterile environment provide the safest place for your procedure. Your OR team is led by an expert surgeon and includes nurses, surgical assistants and technologists, anesthesiologists and nurse anesthetists. Our waiting room offers you and your loved ones a calm, comfortable, family-oriented environment during your stay. We want you and your family to be as relaxed as possible during the often stressful waiting period before and after surgery. Don’t hesitate to ask us questions if you feel the need.